During a May 25, 2017, press conference, NASA scientists released the first early results of science data gathered by the Juno spacecraft around Jupiter. Much of what has been found has scientists questioning everything they had previously believed was understood about the king of planets. Several of the key members of the Juno team reported on the data while an abundance of papers was simultaneously released – 44 to Geophysical Research Letters and two to Science. Bolton spoke about the puzzling results that have been received from Juno. The initial two science gathering passes on Aug. 27 and Dec. 11, 2016, provided the bulk of the data thus far; however, additional data continues to be sent by Juno with each pass – the most recent one just last week on May 19, 2017. Among those results, information about the interplanetary dust, Jupiter’s rings, plasma wave recordings, gravitational and magnetic field data, Jovial auroral formation, as well as the chemical and physical composition of Jupiter, and the big question about whether Jupiter has a core. Jupiter has proven to be far stranger than anyone had anticipated. In fact, Bolton repeated on several occasions that nearly every model scientists have for what to expect about Jupiter has been found to be wrong. Everything from gravitational field data that showed the internal makeup of Jupiter wasn’t as homogeneous as they had expected, to magnetic field data which indicated that Jupiter’s magnetic field is lumpy and varies from location to location, to how the Jovian auroras seem to be generated in a nearly opposite fashion as to aurora on Earth. Every item but one was unexpected – that being the gap in radiation just above Jupiter’s equatorial region, but that wasn’t as expected either. 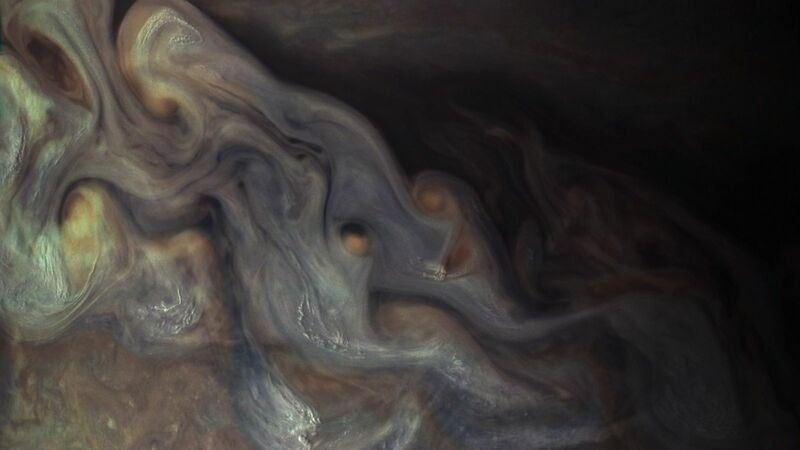 Unlike the typical zones, belts, and the iconic Great Red Spot that people are used to imagining whenever we think of Jupiter, the first views of the gas giant’s poles that scientists received when Juno arrived on July 4, 2016, challenged those assumptions. Contrary to anything that has ever been seen in the Solar System, and far from the banded atmosphere of the central regions, the polar regions were seen to be highly individual, with the northern and southern polar regions of Jupiter being unique miasmas of cyclonic and anticyclonic activity. These giant swirling storm masses are composed primarily of ammonia gases and ices. Some storms as small as 31 miles (50 kilometers) across and others are massive behemoths up to 870 miles (1,400 kilometers) in diameter, nearly 20 percent the width of the Earth. The cloud deck weather patterns also seem to penetrate deeper than suspected, including heavy ammonia clouds. Instead of being limited to the highest layers of the cloud tops, the ammonia seems to originate much deeper, with strong ammonia signatures at depths of at least 220 miles (350 kilometers) down. These signatures run between surface clouds, which extend down 60 miles (100 kilometers), and the convective region which begins at about 310 miles (500 kilometers) deep. Gaseous rivers of ammonia seem to well up in convection patterns, especially thick in the equatorial region, and then reach up into the highest elevation of the clouds. The ammonia clouds on the surface of Jupiter are suspected to be extremely cold, and possibly contain a mixture of both water and ammonia ices which could rain, hail or snow down into the 620-mile (1,000-kilometer) thick meteorological layer. Deeper down into the atmosphere, the pressure and temperatures both increase steeply. At 250 miles (400 kilometers) below the surface of the cloud tops, the atmospheric pressure reaches 300 times that of the surface of the Earth, and temperatures spike from the super cold cloud tops at less than minus 108 degrees Fahrenheit (minus 78 degrees Celsius) to more than 1,160 degrees Fahrenheit (630 degrees Celsius). Scientists expected massive magnetic and radiation fields, and they weren’t disappointed. Even so, the magnetic field data were both far higher and far lower than anticipated. In the expected small area close to the surface of the equator, the radiation ended up being ten times lower than what was expected. This result is a blessing for the spacecraft, especially the JunoCam instrument which is located in a non-shielded location and wasn’t expected to last more than a handful of passes. The lower radiation is likely a major contributor to the camera’s continued health and is expected to last another year or more. On the other hand, the radiation and magnetic fields across the rest of the planet are dramatic in their magnitude and spatial variation. 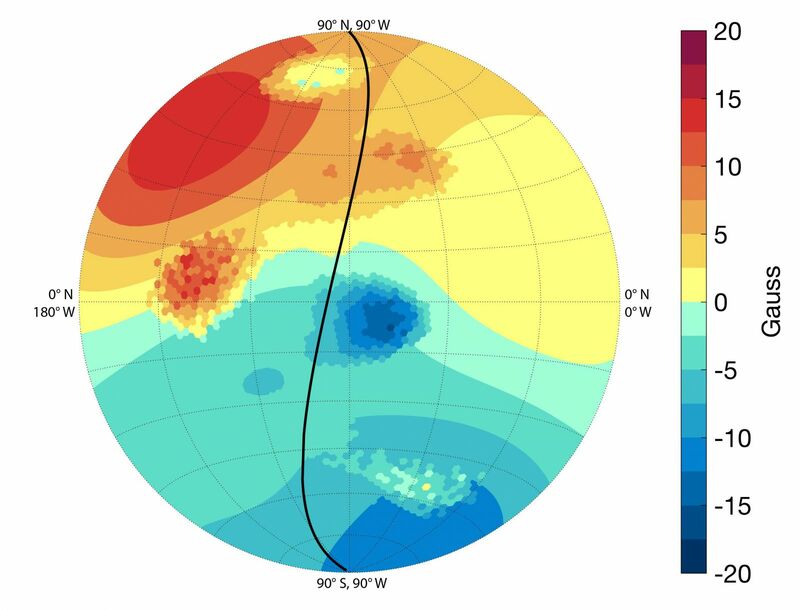 The highest magnetic field observed so far has been measured at 7.77 Gauss, which is more than ten times the highest maximum magnetic field that has ever been measured on Earth, which was 0.66 Gauss at the South Pole. These results far exceed the anticipated strength of the magnetic fields. Dynamos are processes which occur when magnetic fields are generated by the rotation and movement of liquid metal. Inside of the Earth, this process is located at the core between the internal solid iron core and the external liquid iron core. The Earth’s core is estimated to make up about 15 percent of the Earth’s volume. The data Juno is returning suggests this process seems to be happening not deep within the planet, but closer to the surface. Metallic hydrogen is an exotic form of the universe’s most abundant element: hydrogen that, when compressed under extreme pressure, takes on a liquid metal phase with free electrons moving over and through it. These electrons are presumed to be the basis for the magnetic fields. 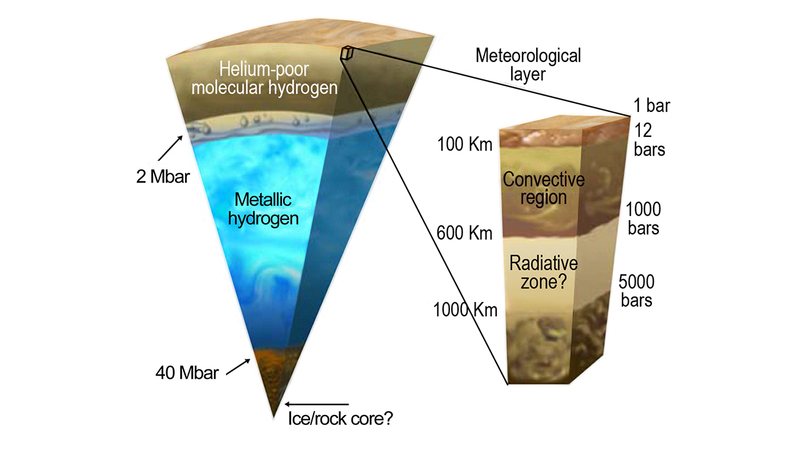 The data that has been returned in these few passes indicates that instead of a solid metal or rocky core surrounded by a small layer of liquid metallic hydrogen, the metallic hydrogen seems to make up the bulk of the planet with the core being a possibly partially dissolved fuzzy mass of rock and ices. Connerney said that the liquid metallic hydrogen likely reaches to 75 percent to 85 percent of the radius of the planet. It is surmised that this is the area where the dynamo, and thus Jupiter’s intense radiation and magnetic fields, are being generated. One of the shocking results that was found is about Jupiter’s aurora – its northern and southern lights. 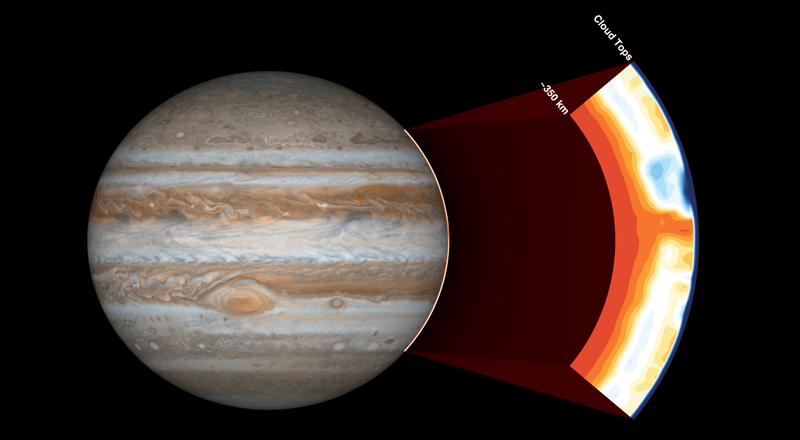 The giant auroral bands that have been seen on Jupiter in the ultraviolet, using the Hubble Space Telescope, have turned out to have very unusual properties. On Earth, the aurora is generated by the interaction of particles from the solar wind with the magnetosphere. A combination of several sets of instruments on Juno was used to discover that, instead of the usually downward interaction of particles from the solar wind, the aurora on Jupiter seems to be generated by an upward escape of rapidly moving electrons from within the planet. During the first science flyby on Aug. 27, 2016, the Stellar Reference Unit star camera collected the first image of Jupiter’s ring taken from between the planet and the ring. While taking the image, the spacecraft was viewing the constellation Orion and as such, the star Betelgeuse can be seen, along with Orion’s belt. Juno also observed plasma wave signals from Jupiter’s ionosphere. The following video shows a frequency-time spectrogram the results of which show an increasing plasma density as the spacecraft descends into the gas giant’s ionosphere during its Feb. 2, 2017, close pass. According to NASA, the actual observed frequencies of the emissions approach 150 kilohertz, which is above the human hearing range. The playback speed was slowed by a factor of 60 to bring it into human audio range. The momentary tones follow a scale related to electron density and are likely associated with an interaction between Juno and charged particles in Jupiter’s ionosphere. Scientists are not exactly sure what is the source of the tones. It is currently being investigated. Juno is in a highly elliptical polar orbit around Jupiter, but the majority of the spacecraft’s data is gathered at perijove – the closest point in Juno’s orbit to Jupiter – which occurs every 53 days. The perijove takes about two hours to traverse the more than 40,000 miles (66,000 kilometers) from pole to pole. The 29-foot (8.8-meter) long, 9-foot (2.7-meter) high probe zips approximately 2,600 miles (4,200 kilometers) over the surface of Jupiter’s cloud tops at a relative velocity of 129,000 mph (57.8 kilometers per second). The eight science instruments, along with JunoCam, collect data as the spacecraft speeds past the planet, after which it takes a day and a half to download the data collected from those two hours.